I recently realized something pretty funny. My dog is not a morning person! For years, I've been used to dogs that wake me up at the crack of dawn. Since I've had Wanda, that just isn't happening. What's more, I have to wake her up, usually by pulling the covers off her which she's burrowed under in the night. She yawns and stretches and eventually ambles her way to the door. When she comes back in, she makes a beeline for the bed and spends the rest of the morning as you see. This is how she prefers to sleep anytime the temperature is below 75 degrees. 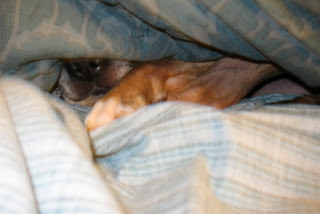 See just the nose and paws sticking out? I tell you, this dog leads a tortured life. You definitely need to come by! See you is the highlight of Wanda's life! I love the sound of dog toenails on linoleum. I love the air-periscope strategy that she has for sleeping. Hooray, Wanda! That's so cute... totally reminds me of my Penny when she was a puppy. Also just read the post on the shop upgrades... very exciting stuff. I hope to stop by soon to stock up! I have just read a bunch of blog entries and wow! things have changed even since I dropped in at the shop a couple of weeks ago. Congrats on hiring someone, that seems like a major step. Also, now you're going to be open 7 days a week, so I guess I need to get my nerves fixed so I can buy more yarn so I knit more than three rows before my left hand falls asleep. Funny entry about Wanda. My Russian cats Baboo and Rikki are also not morning cats. That's very Russian of them. Hope you're well and that the summer is winding up nicely for you. Knitting (or is it yarn buying) season is just around the corner!